Monica Awbrey joined CCGD in 2016 as vocal coach and currently serves as assistant conductor of Women's Youth Chorus. She is currently involved with several choirs across the area as a director and a singer, including Christ the King Catholic Church and Cathedral Arts at St. Matthew’s Cathedral. Inspiring young musicians is her passion, and she is fortunate to teach music at The Episcopal School of Dallas, teach private voice lessons to young singers and teach music camps every summer for various organizations. Previously, Mrs. Awbrey directed choral programs at Allen High School, Rowlett High School, and Taft High School (San Antonio). 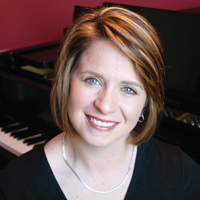 She has also served as the director for the Christmas Celebration Children’s Chorus for the Dallas Symphony Orchestra. As a singer, she has performed with Orpheus Chamber Singers, Orchestra New Spain and the Dallas Bach Society. She has also held music positions at Church of the Incarnation, Episcopal Church of the Transfiguration, Highland Park United Methodist Church, and The Dallas Bach Society. Mrs. Awbrey holds Bachelor of Music and a Master of Arts in Teaching degrees from Trinity University.